Posted on May 11, 2016 by Eric Zuesse. 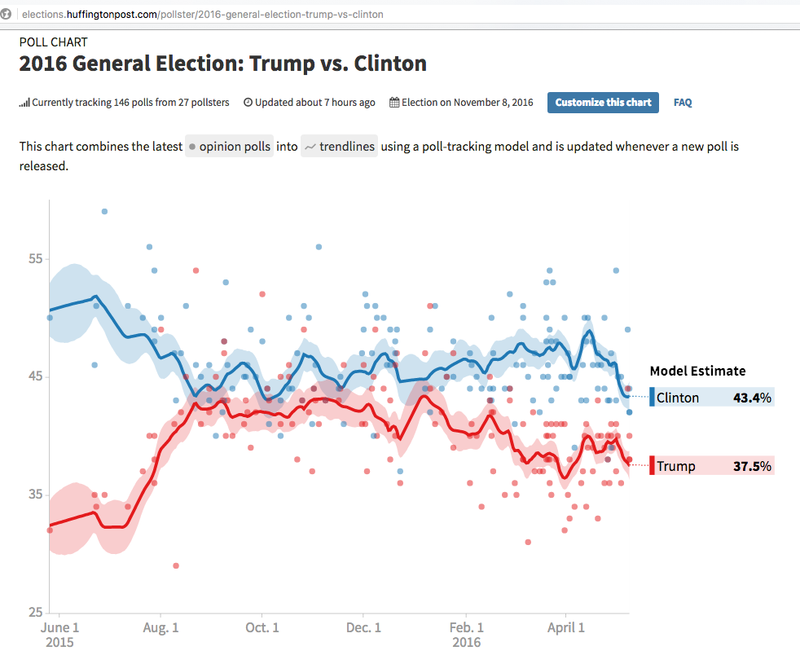 A Reuters/Ipsos poll was released on the evening of Wednesday May 11th and headlined, “Trump draws even with Clinton in national White House poll”. 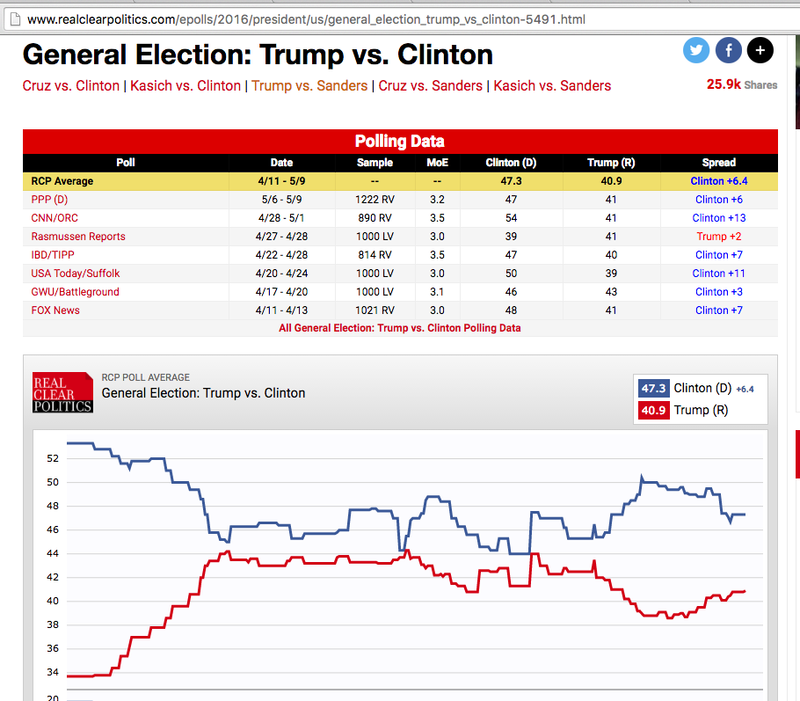 Whereas Sanders would beat Trump 51.8% to 38.8%, and this 13% victory-margin for Sanders has been remaining fairly steady for many months now; Clinton would beat Trump 47.3% to 40.9%, and this 6.4% victory-margin for Clinton has been declining for months — and might now be gone since Trump became the Republican nominee. 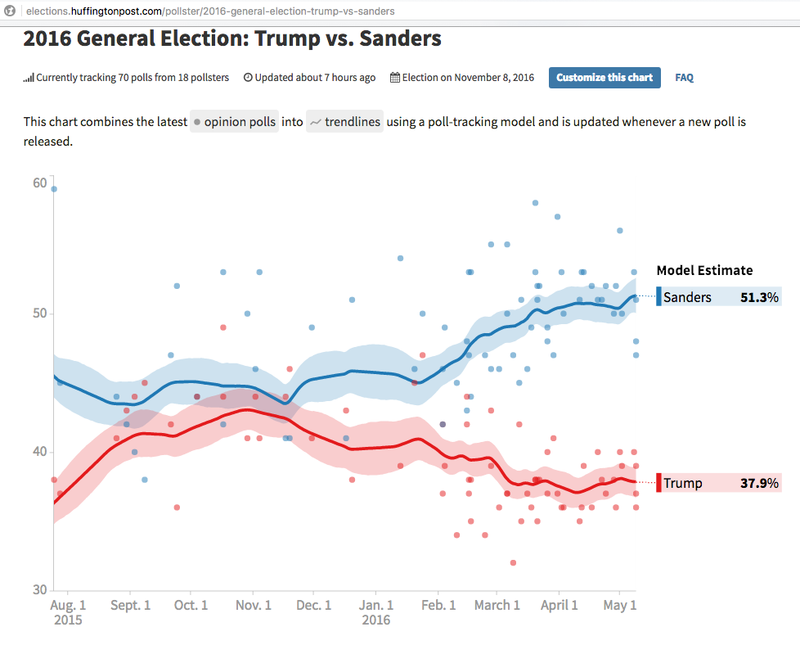 Whereas Sanders would beat Trump 51.3% to 37.9%, and this 13.4% victory-margin for Sanders has remained fairly steady for many months now; Clinton would beat Trump 43.4% to 37.5%, and this 5.9% victory-margin for Clinton has been declining for months — and might now be gone since Trump became the Republican nominee. 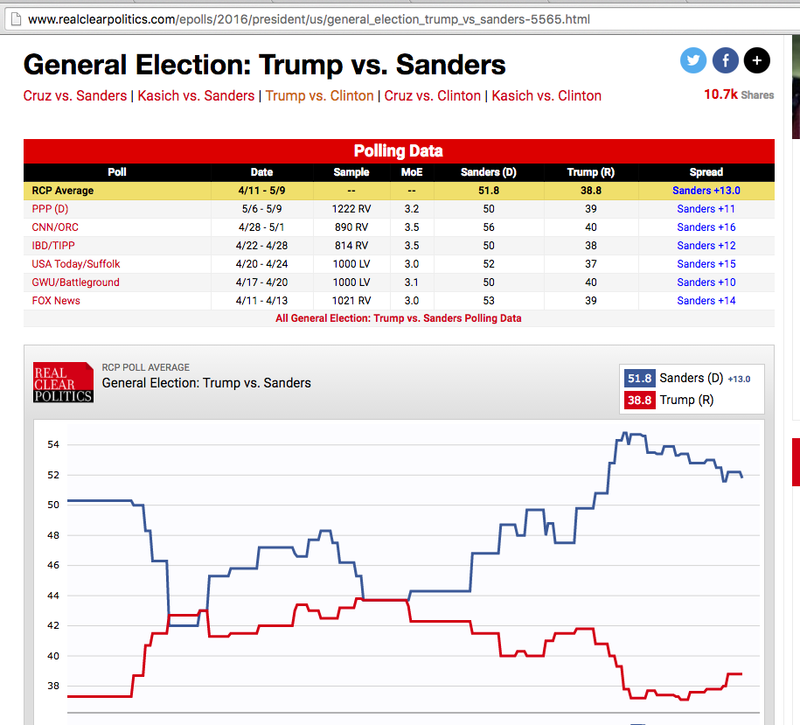 Thus: both the RealClearPolitics composites and the HuffPostPollster composites indicate a close race between Clinton and Trump, but a clear victory for Sanders over Trump. If Democrats don’t want anti-abortion new members of the U.S. Supreme Court and other courts, and also more Republicans on the lower courts, then Sanders is the clear way to prevent that, but Clinton might not be; and if current trends are any indication, Clinton would fail at that. Therefore, the question for Democratic Party superdelegates is whether they want a successful Party, or whether instead they want their Party to be led by a failure who is slightly preferred by Democratic Party’s voters but definitely not by the entire U.S. electorate, and who is shown in the trendlines to be likely to fail in the general election. If Clinton becomes chosen by the superdelegates in order to satisfy the preferences of her voters, instead of Sanders becoming chosen by those superdelegates in order to serve the needs of the Democratic Party and the preferences of the entire American electorate, then there is a possibility that Trump might not become the next President, but (if current trends continue any further) Trump probably would become the next President. However, there is also a very different type of possibility: the possibility that Sanders would run a campaign whose message will be “Write in ‘Bernie Sanders’” — that he will be campaigning for the votes of everyone who wants him to become the President, to simply write his name in on the Presidential ballot. This will offer a realistic third possibility: for the first time in over a century, a President who is from neither the Democratic Party nor the Republican Party — a real break away from the toxic politics that now is strangulating the United States and blocking all progress, desperately needed progress, in America. Would as many people donate to that campaign as donated to Sanders’s Democratic primary campaign? Would even more people donate to it than donated to that primary campaign? Would it receive enough money to be viable for to be able to win the Presidency? That would be the subject of his write-in campaign, to present to American voters, if he chooses to present it. Before Sanders entered the Democratic Party primaries, his name-recognition amongst the general American electorate was below 10%, but now it’s so high (and so favorable) that for many months the polling has shown that more Americans want him to be the next President than want anyone else to be. That’s the reason why, whereas a ‘third party’ run by Sanders back at the beginning would have been doomed from the start, an independent write-in campaign for him now would stand a real possibility of victory. Of course, electronic voting machines, and other methods that might not provide the ability for a reliable count or recount of actual votes, would be a problem no matter whom the candidates are. But a write-in campaign for Sanders could win the most votes, if he wages it. This entry was posted in General and tagged Clinton, polls, Sanders, Trump. Bookmark the permalink. Is there anything Nancy Pelosi would impeach a president, vice president, or justice for?